As the children got older, Alvin and Milly encouraged their children to learn. “Mom and Dad gave us a wonderful life. They provided us all with an education, and in return, we came home for the summer and worked on the farm. We had a choice of what we wanted to do: house work, field work or yard work.” Jackie chose milking and yard work. She especially loved working in the flower beds with her mother. David enjoys contributing to the family business, too. 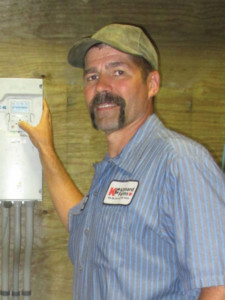 “It’s been very interesting to learn the business of dairy and help with the financial side, including projections. I only had the pleasure of knowing Alvin for a couple of years. He passed away unexpectedly three months before our wedding. It would have been Milly and Alvin’s 43rd anniversary on our wedding weekend. Jackie’s parents were very progressive people, and I know they would be so happy to see how the farm has changed,” says David. Ever since I could remember, I tagged along with mom around the farm. She was the cow person and taught me everything she knew. I was a good student, but when I started school at UW-Madison, I couldn’t wait to get back home, where you know your neighbors and where everybody stops and says hello when they pass each other on the road. I came home after just a semester and jumped right back into the farm. We were milking about 140 cows, and I loved every minute of it. I already had lots of ideas of how to keep mom and dad’s progressive vision going while trying new approaches to provide our cows with the best there is in comfort and provide more jobs in our community. I also helped bring in one of the first cow care consultants, a dairy cow nutritionist. We were one of the first farms to do this and still continue to be progressive in making sure our cows have whatever it takes to make them comfortable. As mom and dad discussed the future, I told them, “I want to do this forever.” I’ve never looked back. After dad passed, it was Rod, Maureen, mom and me. Mom was my best friend and my greatest cheerleader. I think she knew, just like I do, that I was born to do this. And, today, when I keep on trying to find a better way to do something, whether it is getting the best quality milk, or testing the soil to find the perfect nutrient balance, I think of her. I know she’d be proud of what we’ve built here. The look of the farm is changing, however mom’s values remain the same. 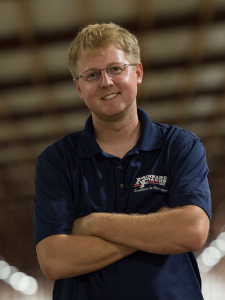 Shaun Hardtke, Director of Dairy Operations, oversees a team responsible for the health and well-being of Kinnard Farms’ dairy cattle. 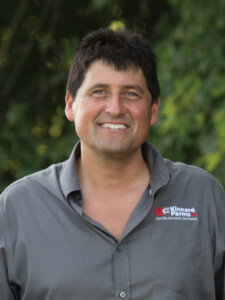 Shaun grew up on a 100-cow dairy farm in southern Kewaunee County. When his family lost their cow herd to a fire in 2001, he discovered his strong passion for dairy. Shaun, who is self-taught bilingual, and his wife, Kimberly, live eight miles from the farm with their baby daughter. Shaun has a passion for miniature trains and is in the process of restoring a 1954 model. We make cow comfort and health a top priority, 24 hours a day, seven days a week, 365 days a year. Our dedicated team of employees works around the clock, led by our herd manager, Amanda Hintz. Growing up on her family’s beef farm in Oconto, Amanda knew from an early age that she wanted to work in the agricultural industry. At 12 years old she saw a news story on milking cows, and she turned to her dad and told him that is what she wanted to do. Shortly after, Amanda began working on a friend’s dairy farm and started showing cows through her local 4-H program. 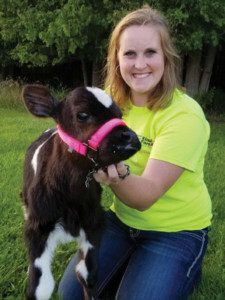 Her passion for dairy cows and the dairy industry continued to grow throughout high school, and, as she began applying to college, she knew she wanted this to be her future career. As herd manager, Amanda oversees the health and well-being of the cows. She also manages her team of eight employees who help her perform daily visual examinations of each cow and record their observations in a computer software program that tracks each cow’s activity. If the team notices an abnormality in the daily activities (walking, eating, milking) of a cow, they perform a more thorough examination. Amanda and her team will work together to create a plan to return the cow to prime health. Amanda pays special attention to the calves that need a little extra care, like her new preemie calf she has named Sweet Pea. Along with Sweet Pea, she also has two dogs, two goats and a cat. Amanda cares for the cows on our farm just as she cares for her pets at home—with a passion and enjoyment that makes her happy to go to work every day. 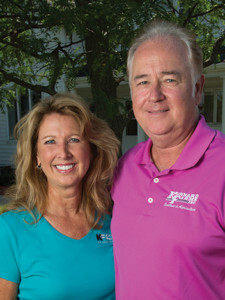 Marty Thiry grew up one mile away from Kinnard Farms. Lee Kinnard and Marty had been talking for years about Marty joining the team at the farm. In January, Marty became the Sand Facility Manager. Now, instead of commuting to Green Bay, he has a two-minute drive to work. After 25 years working swing shift at Georgia-Pacific, Marty wanted more quality time with his wife, Sue, and their teenage children. Missing their high school activities was no longer an option. Marty manages the equipment in the sand recycling facility along with four other employees. 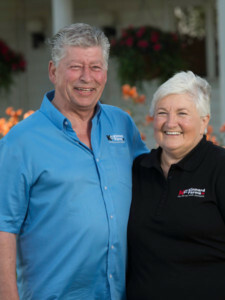 “Everyone on the farm focuses on innovation,” said Marty. In the sand facility, augers separate the sand from the original mixture of manure, sand and recycled water. The augers convey the sand, which is still dirty at this point, to a sand washer. The washers scrub the sand clean using recycled water that has been captured from the cleaning of our milking machinery. After drying, the sand is clean and infinitely reusable.